Yes, there is another alternative for new garden planters. The next time you see a Styrofoam box being discarded, don’t let it go to the local landfill. Rescue it! Make a new and different garden planter! ( Be sure to still recycle all of your cut-off pieces.) 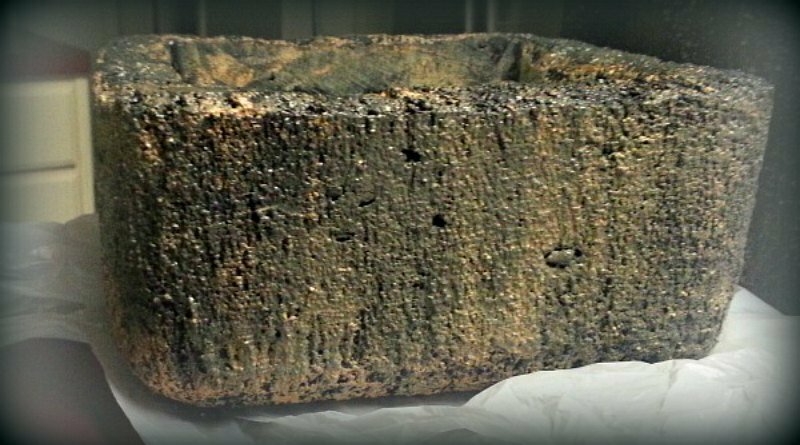 And you can make it look like a cement planter or hypertufa planter. And it can be any color you imagine! Match it to a holiday theme, or to accent the color of your favorite plant’s blossoms. 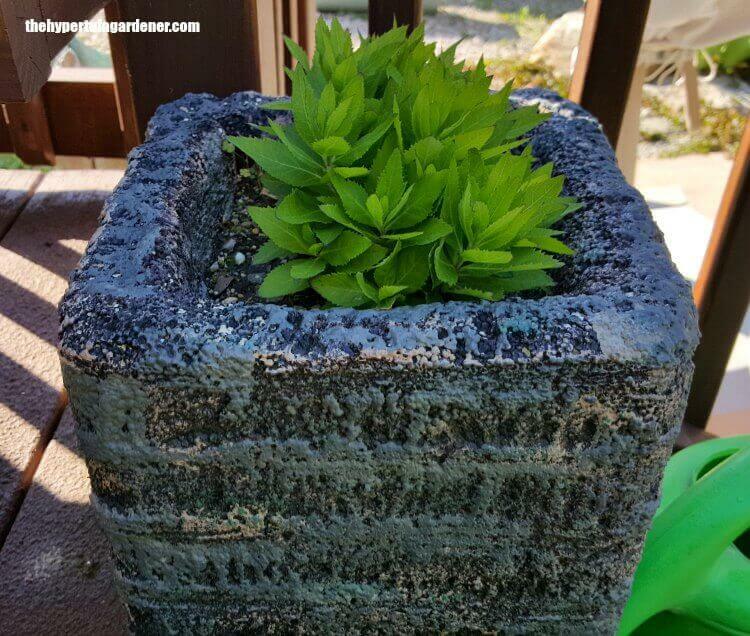 I have written about my “homemade” garden planters made from the discarded Styrofoam boxes that we all see here and there. I see them mostly from where steak or fish is packed in them for shipping purposes. Those boxes are usually the larger ones seen. But there are also those that are used to ship pharmaceuticals . These are usually the ones with the stronger thick sides that I favor. You may be able to get some from the local hospital or drug store. They are typically discarded via recycle bins, so ask for them and you may score big! How do you make a garden planter from these, you say? Well, let me just show you a few that I have made. And you will find all the directions on this page. 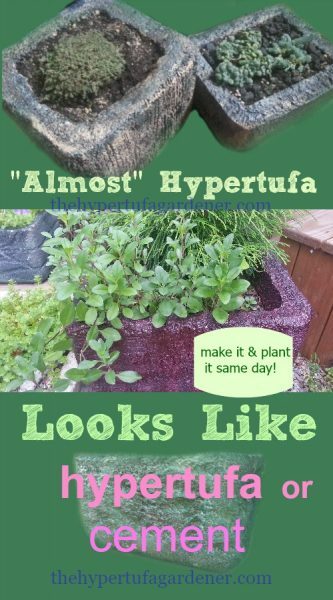 I have called these “Almost” Hypertufa and Faux Hypertufa. They are really nice planters. This page explains the step-by-step method for making them. So easy! The Styrofoam planter above is planted with Platycodon “Sentimental Blue” which is a tiny Balloon Flower. Well, the plant is small but the blossoms are just as big as on the regular sized plant. 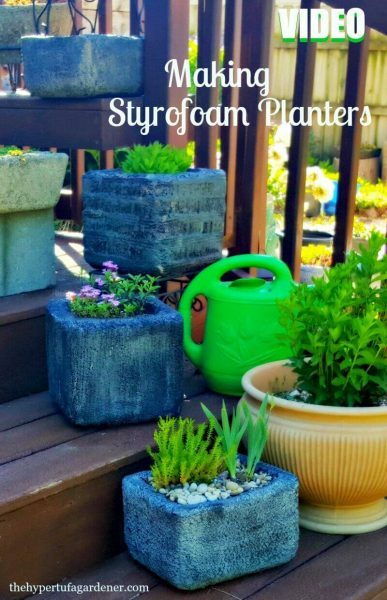 And the best part is you can plant these Styrofoam planters up in just a day or two. Those who are in a hurry all the time like me ( I like instant gratification) will be able to plant them up in no time. Check out how these are looking. No worries in winter because they survive well. 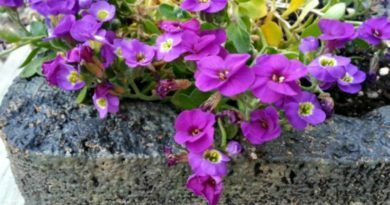 The insulation provided by the Styrofoam benefits your plant anyway. I encourage you to try this. Those large garden planters and pots are so expensive any more. Especially cement pots which are so heavy. And you need someone to just get them home for you. There are the resin garden planters, but those are really expensive when you want a pair or more. And these garden planters will look great and can be tailored to suit any color scheme or bloom color you want. The sky is the limit. So try them. Note: Not for food crops, please. And let me hear about or see them on my Facebook page. I would love to see them and I am sure everyone would be inspired. ← Don’t You Need More Room For The Roots?